Sunday afternoon and I purchased a 4lb leg of lamb - it was time to re-live a tradition from my childhood - a Sunday roast with potatoes and veggies. I am also in the midst of financial frugality so this also enabled me to partake in several options for leftovers. While in England recently, I came upon a TV chef who I really enjoyed watching: James Martin. I found the basis for this recipe on the BBC Food website. I love roasted leg of lamb for its simplicity, the lovely aromas, and basically because it is delicious. Along with the leg of lamb you need a few garlic cloves (cut up into 1/4 to 1/2 inch pieces), some fresh rosemary (I actually omitted this), olive oil, and a few potatoes (depending on the number of people you are serving). Remove the lamb from the refrigerator to sit for 30 to 60 minutes. Pre-heat the oven to 400 degrees. Insert a paring knife into the lamb every few inches and insert the pieces of garlic and a few rosemary leaves (if desired). Season with kosher salt and fresh ground pepper and then drizzle with olive oil. After placing a roasting pan on the bottom rack of the oven, place the leg of lamb directly onto the middle rack. The roasting pan will catch the fat dripping from the lamb and will be used to roast the potatoes. Par-boil the potatoes for about 5 minutes. Drain them, return them to the pan, and shake the pan to make the outside of the potatoes look fluffy. After the lamb has cooked for about 20 minutes, add the potatoes to the roasting pan, coating them with the lamb fat. Turn the potatoes a few times and they will be chunks of golden brown crispy loveliness when they are done. Season the potatoes with salt and pepper just when they are removed from the pan. The lamb will take about 1 to 2 hours depending on the cut, the size, and how you like the lamb cooked. I served this with carrots, peas, and mint sauce. I paired the meal with a lovely organic Bordeaux - Chateau Peybonhomme Les Tours 2005 Premieres Cotes de Blaye. Note: you can save strain and save the fat from the roasting pan - keep it in a dish in the refrigerator and use it - lamb fat is delicious. I had purchased some pork belly a while back that had been stored in a friend's freezer and it had been hinted to me that it was time to figure out what to do with it. I found a recipe for braised pork belly - Dong-Po Pork on an Australian website (The Old Voodoo Kitchen) and made some changes / substitutions, but the result was fantastic. Scrape the pork belly it to make sure it’s free of bristles - a disposable razor can be used for this. Blanch the pork in a pot of boiling water for 10 minutes, then drain well and dry thoroughly with paper towels. 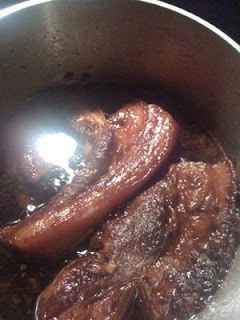 Heat the peanut oil in a pan or a wok until it is very hot and then fry the pork belly in one piece until it has a good color and the skin is crisp and brown. Warning - this will cover you and your kitchen in hot oil - use a splatter guard if you have one. The skin has to be crisp or it will go chewy after braising it. In a saucepan add the spring onions, ginger, rock sugar, soy sauces, and rice wine. Bring to a boil to dissolve the sugar. Add the pork, cover and simmer for between 2 and 4 hours until the pork is very tender. I simmered the pork for 4 hours and it was delicious. Remove the pork, drain, and slice into about 3/4 inch slices - the pork will be falling apart. Strain the cooking juices, skim off the oil on top, and serve with the cooking juices on the side. The sauce makes a lovely dipping sauce for bread as well. We enjoyed the dish with an off-dry chenin blanc from the Loire Valley - the Belliviere 2005 Coteaux du Loir Vieilles Vignes Eparses. From 50 to 70 year old vines this wine has apple, honey, minerals, and a little bit of residual sugar. It was a lovely match and would have been even better if the pork had been spicier.... next time perhaps I'll add some spicy peppers to the braising liquid. For the price - a lovely dram of blended scotch from Islay - fruity with a slight sweetness, it has some classic Islay smokiness with just a hint of peat. What more could you ask from a bottle that costs about $26?